As I was sitting by Lake Michigan at a restaurant with a lakeview, I saw this guy skipping stones and a couple that were taking off together in their little boat. I loved the energy in this moment, and it seemed to have a heat in it! The boy was getting ready to skip that stone, and really throw it hard into the lake. And the couple were perhaps looking to have a romantic moment further out in the water, alone. But in that 1 instant, they were in the same ‘frame’. I loved seeing this from the shore. What a creative and artistic way to express this moment in time. Wonderful image and words. Have a great day! thank you Sue! I’m in a photography class and I’m experimenting with new things. It really is interesting to see a variety of intentions all at once, intersecting with one another. It’s like God’s mind at play. Great idea! And I really enjoy the heat motion look. It’s gives the feeling of someone observing with special motion goggles, and capturing the energy of the moment. Very creative! thank you John! I had fun with it. Linda, I love what you did to the picture. One day it may be that young fellow taking his sweetheart for a boat ride. How quickly time passes. Thank you for reminding us to savor the ‘frame’ of this moment. yes that’s a good point Wendy! I didn’t even think of that possibility. I wonder if he will think back on this time when he is the man in the boat! hehe. Thanks for your lovely thoughts. Yes it is Joshi! Thanks for stopping by. I had fun with this one. I like to people watch, making this game a fun visual like you did! 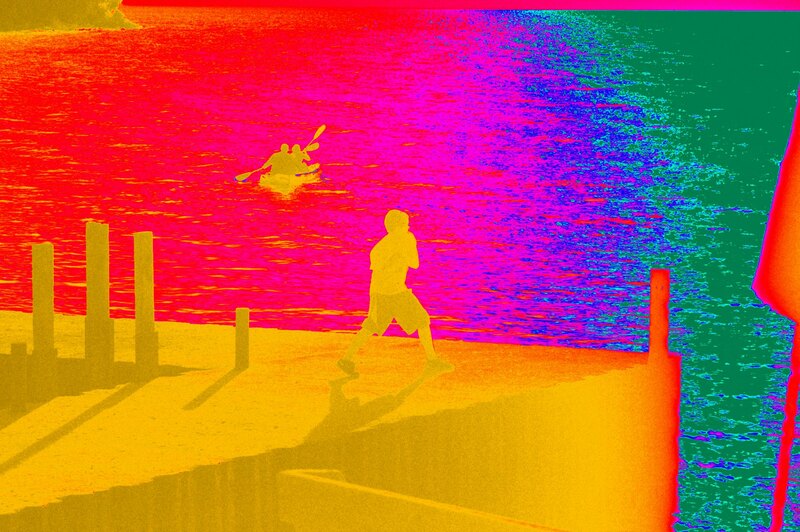 You saw energy and I loved the photo or artwork with the rainbow colored silhouettes! thank you Robin. This was actually a photo kind of doctored up. Not my usual thing, but sometimes you need a change. I love to people watch too. There was plenty of drama and intrigue going on! thank you Suzy! I don’t know about selling this one. But I guess you never know until you try. I don’t think I’d need a photo release! that’s for sure. Thank you for stopping by. I never get tired of looking at how people, in this case, you, capture life and its ordinary (yet special) moments!! Yes, I guess it must have looked ordinary to the people around these 3, but to me it did seem special. Thank you for noticing that! And as always, I so appreciate your visits. thanks djmrakiey! Not my usual, but I’m trying to think outside of my usual box. Linda I wish I had been at the lake and saw the man and the little boy. It’s just moments like that that make life worth living. Indeed they do. Thanks Cindy for your visit!